It is an amazing feature which you have identified on Tableau but I have problems getting that working on Tableau 8.2. 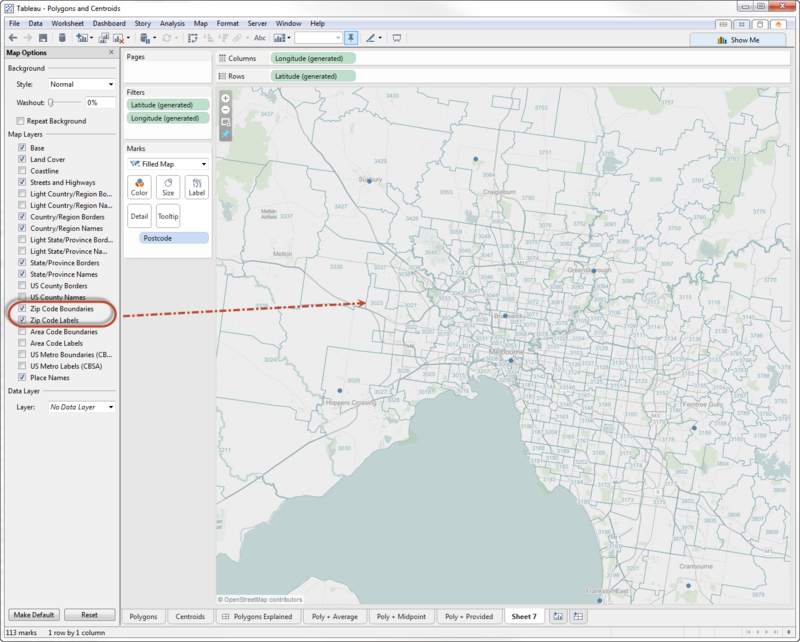 Basically, I have got Country(Australia), State, Postcode in my data but when go to Map options the “Zip Code Labels” and “Zip Code boundaries are greyed out”. Any reasons why it is doing so? Your insights very much appreciated. You’re actually combining two issues together here. This blog post talks about postcode boundaries and labels being present in the background tile layer. This doesn’t need you to have postcodes in your data – in much the same way that you don’t need street names in your data to have that included as part of the background tiles. I suspect the reason you can’t enable the zip boundaries and labels in your map is because you aren’t zoomed in far enough. Some of the details in the map options are only available at deeper zoom levels. Try zooming in closer on your map and see if that makes the check boxes active.